Is a New SUV Right for You? At Audi Midtown Toronto, we are always excited to talk with our community about the new features and benefits of an SUV. An SUV provides drivers with the towing power and the cargo space of a large vehicle. If you like to go on trips or have of people or cargo to transport, an SUV is a great choice. Towing with an SUV is easy. Most newer SUVs come with a tow package and some have sway control. If you tow gear for off-roading or the beach, or if you need to transport horses to your property, towing is simple with an SUV. 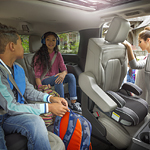 If an SUV has a third-row seat, you can carry many passengers in your vehicle. Carpools and events with a group of friends are easier with a large vehicle. You can also fold down seats in most SUVs for the ability to load bulky items. An SUV can be a great way to end the need for two vehicles.